It is possible that I am the Brussel Sprouts’ #1 fan. Last year I spent countless hours passing out recipe cards, guiding those willing to embark, on the basic cooking techniques of Roasted Brussel Sprouts. I wrote events in our, then six, stores, basically forcing managers to offer these tiny green balls of gas. Let’s be honest, I can’t convince everyone and that’s a reality I can live with. BUT, it’s not stopping me from reinventing the standard each year, creating a staple go-to dish that can be brought to a party just as easily as made on a Sunday evening for your family. Cooking is kind of like getting dressed. There’s a whole closet of possibilities at your fingertips. Starting with a solid base sets the foundation for something magical. Thus, with no further adieu, I present this year’s version of Roasted Brussel Sprouts, featuring golden raisins, caramelized onions and apple cider vinegar. Accessorize as you see fit. 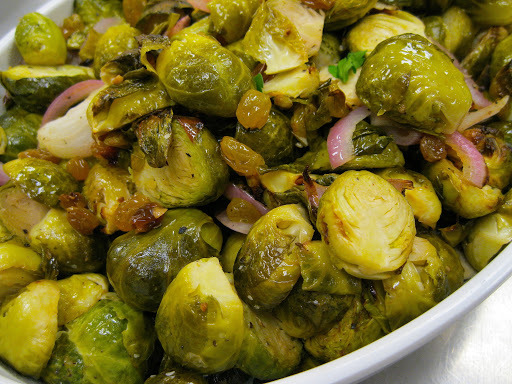 1) Preheat oven to 400* F. Wash sprouts, trim ends and slice in half, put into a large bowl. 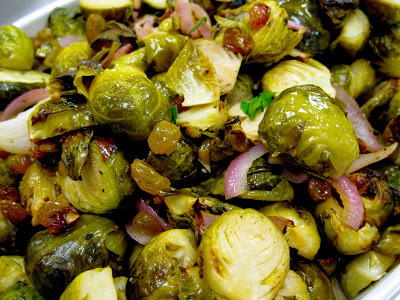 2) Combine all ingredients (except finishing sauce), toss to coat brussel sprouts. 3) Grease a 9×11″ baking dish, spread mixture and cover; bake for 30 minutes or until a fork can just pierce the center of the sprout. 4) Uncover, toss and bake in the top third of oven (close to the heat source) for another 10- 15 minutes, or until some leaves are crispy and dark. 5) Mix finishing sauce ingredients. Pour over sprout mixture and toss to coat. 6) Pour everything into a serving bowl and enjoy! This looks amazing. Definitely trying these!